– Wheatgrass is one of the best sources of chlorophyll available. 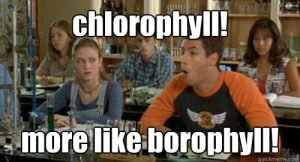 Chlorophyll builds up your blood and contains enzymes that can help slow the aging process. – Wheatgrass treats many skin conditions including eczema and sunburns by helping skin cells regenerate quickly. – Supplements containing wheatgrass aid in weight loss by managing the thyroid gland. – It’s known for its detoxification effects, cleansing the liver of heavy metals. – The B vitamins in wheatgrass can help overcome anxiety and depression. We could go on and one … wheatgrass may help prevent cancer, it benefits digestion, treats arthritis, lowers cholesterol and boosts immunity! Okay, okay, we’ll stop. Should you need a few more click here for 50 reasons to drink wheatgrass everyday!